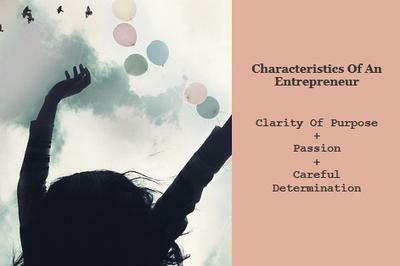 Characteristics of an entrepreneur: I would describe the most successful entrepreneurs as having clarity of purpose, passion, and careful determination. I am in the process of starting two businesses and have worked for several successful start-ups. What I have learned in my experiences about successful entrepreneurs is that they have a genuine belief in what they are starting, and they know how to build the right teams to execute their vision. These are people who don't have any fear of networking, know their own strengths and weaknesses, and are not averse to delegating. I've worked in two different start-ups where the founder did not have the technical skill to make their idea come to life, but they knew how to hire skilled people to do that work for them. Other Characteristics Of An Entrepreneur Include Goal Orientation And Goal Commitment. Also, because it can be such hard work and involve such long hours, entrepreneurs have to be goal-oriented and committed. I think it is a competitive nature that drives some, for others I believe they seek financial success or professional prestige. Whatever the force is, it has to be innate. I've Also Noticed That Most Of The Successful Entrepreneurs In My Network Are Early Risers, And Several Are Non-Drinkers. These people have devised habits and ways of life that give them enough energy to complete long days in an environment that offers no guarantees. Obviously, high risk tolerance is necessary. Add to that an understanding of the financial details necessary to run the business, and the capacity to engender the support of the right investors and board members. Many Entrepreneurs Are Self-Starters, But They Are Also Gregarious People Who Understand How To Work A Room And When To Ask For Help. It is important to maintain the right level of control of the company, as when investments are accepted some measure of control is relinquished. It is also critical to have an exit strategy and to have a sense of what the objectives are. Another Remarkable Set Of Characteristics Of An Entrepreneur Is Coupling Business Start-Up Efforts With Their 'Big Why' And Their Strategy. Regardless of the rationale behind starting a business, many successful entrepreneurs know what they want to achieve and then they strategically go after it. If a company is being started to make the founder happy and comfortable, the strategy will be different than if the company is being started to grow rapidly and be acquired by a larger firm in the industry. In sum, I would describe the most successful entrepreneurs as having clarity of purpose, passion, and careful determination.